Well have I got something to show you today. The other day I wanted a square canvas to do one of my mixed media girls on so I cut the 5x7 canvas board to make it 5x5. I had a 2x7 piece left over and was about to toss it when my hand stopped at the garbage bag. I then put the piece down thinking what can I do with this???..... hmm. Well I cut that piece to make 2 more mini canvases of 2x2 with just a small piece left to throw out. 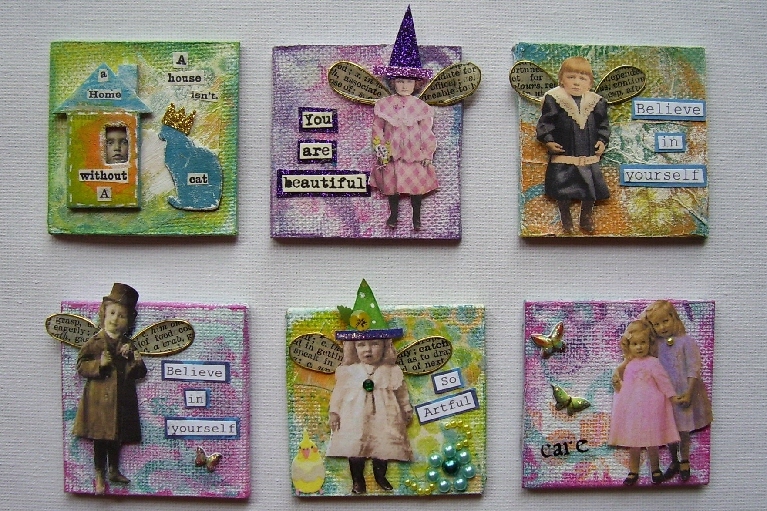 And here is what I did with those small canvases, they are so much fun to make. 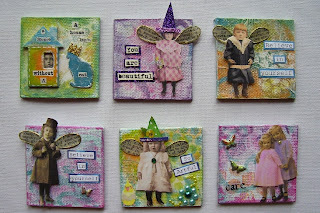 I did layers and layers of painting using bright colours, sequin waste for a stencil, bubble wrap as a stamp, gesso and some have a few pieces of paper that I first collages then painted over for added texture. A couple canvases I put crumpled tissue paper that I got from a gift at Christmas and before you know it it was transformed into a background. I made wings using Webster Dictionary pages, wire and Glossy accents and various other elements hanging around. I had some chipboard Maya Road houses that I have had forever, some ARTCHIX eco shaped cats and this is what happens when you get a mess in front of you. Thanks for dropping by and take care all. These are ADORABLE!!! I was trying to figure out which one was my fave....and decided I love them all!! Love the little sentiments on each one!! Sooooo cute!!! Love the backgrounds and the images and sentiments are great! fabulous canvas twinchies--love your style! Waste not want not! my motto any way... Love how these turned out. wow how sweet they turned out....love that you did not toss them and made such a wonderful set of fairies out of them!!! These are so cute, exactly what I want to do. How did you get the edges to look so finished? Love these mini ones, they turned out great! I have yet to try a canvas at all. Thanks for inspiring!